World light-heavyweight champion Nathan Cleverly's manager Frank Warren has said he is keen to set up a fight against American Bernard Hopkins at Cardiff's Millennium Stadium. 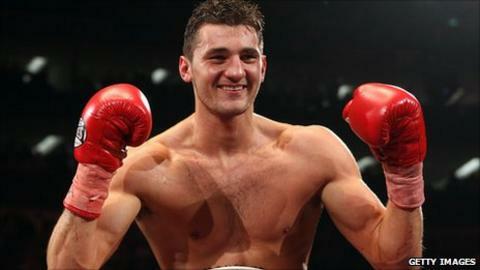 Wales' Cleverly made a successful first defence of his WBO light-heavyweight title by defeating Aleksy Kuziemski. And Hopkins beat Canada's Jean Pascal in Montreal to secure the WBC and IBO light-heavyweight titles. "It would be nice to get it on some time before Christmas," said Warren. Warren added that the Millennium Stadium, where Cleverly has fought on three previous occasions, would be the perfect venue for the bout. "If we could make him and Bernard Hopkins, that's the home for it," Warren told BBC Wales. "Hopkins had a good win at the weekend. "Anything's likely at the moment. Nathan is up there with all these guys. "He's a fabulous champion and I do believe he's got the beating of most of them." The 24-year old had been installed as world champion after title holder Juergen Braehmer withdrew because of injury prior to last Saturday's bout. He was stripped of his title and Cleverly, the interim champion, was awarded the belt by default. The German was then replaced by Tony Bellew on Thursday but he later failed a check weigh-in and Kuziemski became the third change of opponent for Cleverly. And Warren was fulsome in his praise of Cleverly's performance despite the setbacks. "He had a fabulous win, especially when you think of all the circumstances surrounding his fight," said Warren. "Now we're looking at a couple of options and I'm meeting with Nathan sometime next week. We'll see what we can come up with. "I would like his next fight to be in Wales." Cleverly has said that a bout against Hopkins, at 46-years old the oldest world champion ever, would be "the long term target." Enzo Maccarinelli has challenged the newly-crowned WBO light-heavyweight champion to an all-Welsh clash. Former WBO world cruiserweight champion Maccarinelli was present at the O2 Arena last Saturday, but Cleverly has cooled any talk of a bout against his fellow Welshman. "You never know what could happen, but at the moment I've got bigger names on my radar," Cleverly told BBC Wales Today. "I'm a big target out there now. I've got the world title and once you've got the world title people are going to start calling you out and want to fight you. "I'm prepared to take on all comers and I'm ready for the big names. I really want the big names in the division. "Tavoris Cloud is an appealing name, he's an American name. He's an undefeated fighter and he's got the IBF version of the world title. He'd be a great fight. "I think I'll end up having one or two defences of the belt and then we can look at one of those big names then."